"This recipe I made because I wanted to use up some instant banana oatmeal I had. I don't use syrup on it because of the sweetness from the oatmeal and brown sugar." Whisk together egg, oil, and milk until smooth. Sift together flour, baking soda, and salt; add to egg mixture along with brown sugar, and oatmeal; stir until just combined. Heat a lightly oiled griddle or frying pan over medium high heat. 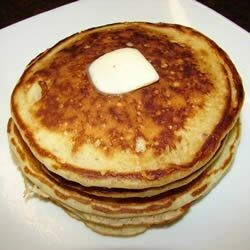 Pour or spoon the batter onto the griddle, using approximately 1/4 cup for each pancake. Brown on both sides and serve hot. Edible, but won't make again. delicious, they tasted even better than pancake mix. i added baking powder to make them fluffy and it helped a lot! definitely making them again. you can use any flavor instant oatmeal. meow. Delicious & great texture! I made the batch and froze the leftovers and they even tasted great in the toaster later!